Sofia gives great priority to expanding its trade relations with Tehran, Bulgarian President Rumen Radev said, describing Iran as a “very important” country in the Middle East. 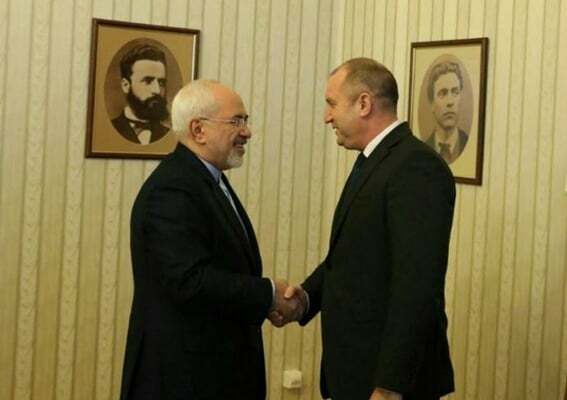 Speaking in a Wednesday meeting with Iranian Foreign Minister Mohammad Javad Zarif in Sofia, Radev expressed satisfaction over Zarif’s visit to his country, and stressed that Bulgaria attaches high importance to its relations with Iran. “Boosting economic relations with Iran is a priority for Bulgaria. To reach this end, we need to remove obstacles to closer trade and strengthen transit routes, one of which is the corridor connecting the Black Sea to the Persian Gulf,” he said. Pointing to Iran’s high status in the region, Radev said his government supports Iran’s efforts to promote peace and stability in the sensitive and conflict-ridden Middle East. The Bulgarian president also called for closer cultural and people-to-people relations between the two countries. Zarif, for his part, conveyed the warm greetings of Iranian President Hassan Rouhani to Radev, inviting him to pay an official visit to Tehran. The top diplomat said Bulgaria is a quite important European country for Iran, partly due to the fact it is the gateway to Europe. The foreign minister said he is pleased to see the two countries are frequently exchanging visits, expressing the hope that Tehran and Sofia will be able to remove obstacles to closer trade, including banking restrictions, to restore close economic relations they had before the tightening of international sanctions on Iran. Zarif, who is in Bulgaria at the head of an economic delegation, said he hopes the trip and a joint economic forum expected to be held during the visit would help prepare the ground for further cooperation between the two countries. “Currently, eight of our provinces have economic collaborations with Bulgaria,” he said. Pointing to Sofia’s support for the Iran nuclear deal, Zarif said Europe played a big role in conclusion of the July 2015 nuclear deal, a great achievement for diplomacy. Zarif said Tehran plays a constructive role in fighting terrorism and extremism in the region. “We always have been confronting terrorist groups in the region, while some of regional countries are still supporting them,” he said. The two sides also discussed conflicts in Yemen and Syria, as well as Iran’s efforts to put an end to these crises.